Existing home sales hit a high for the year in August, however, year-over-year sales were still down. Inventory remains tight on a county level as the increased demand for homes continues to outpace the number of homes coming onto the market. The pace of year-over-year price increases slowed somewhat in August, and on a monthly basis prices remained consistent. 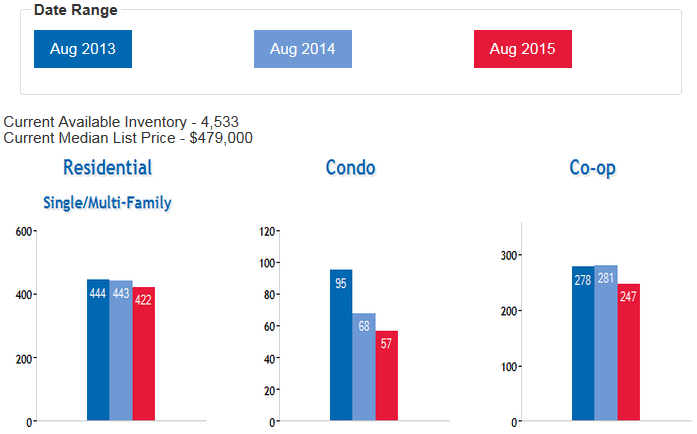 Prices typically peak in June and slowly decline for the remainder of the year, however, prices in Queens actually peaked in August this year. Mortgage rates remain subdued at the moment as recent market turmoil has likely caused the Federal Reserve to reevaluate the timing of any interest rate increases that may occur this year. 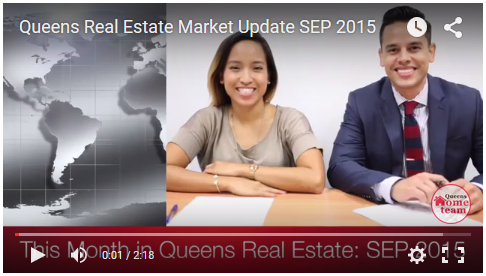 Overall, the Queens real estate market has remained the same throughout most of the year and we are seeing a steadiness in buyer activity mainly due to the anticipation of a rate increase by end of year. 30-year interest rates took a slight downward tick in August amid serious turmoil in global markets. 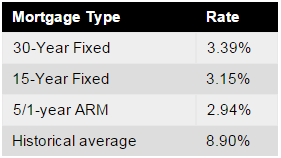 Currently, Freddie Mac reports the following figures: 30-year fixed rate, 3.93%; 15-year fixed rate, 3.15%; 5/1-year adjustable rate, 2.94%. Homes sold at a seasonally adjusted annual rate of 726 homes in August, up 3.0% from July and down 8.3% from the same month of the previous year. August posted an 8 month high for home sales this year. 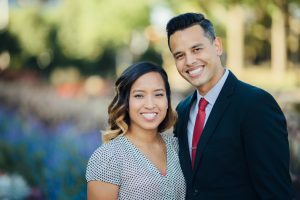 Most indications show continued strength in the housing market in the next few months to come, however, interest rates can affect buying power, which ultimately affects home sales and prices so we will need to monitor this closely through the end of year. Specifically, Residential home sales are down 4.7%; Condo home sales are down 16.2%; And Coop sales are down 12.1% compared to August of last year. 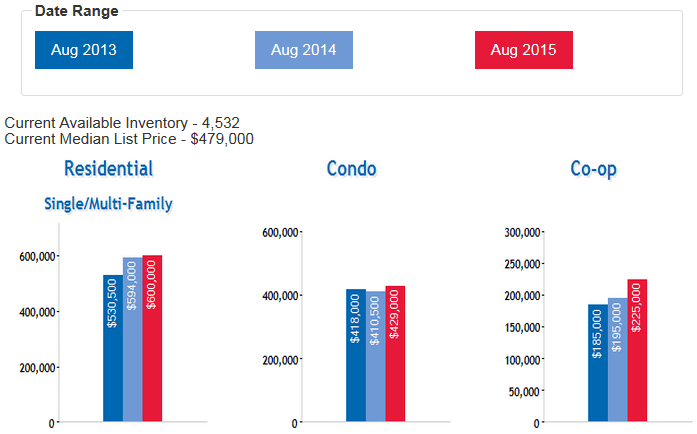 Home prices rose slightly in August to $425,000, up 1% from July but still up 6% from the same month of last year. As we move into the fall months, we should begin to see some seasonal alleviation on prices; however, year-over-year gains will likely remain strong. Specifically, Residential home prices are up 1%; Condo prices are up 4.5%; And Coop prices are up 15.4% compared to August of last year. 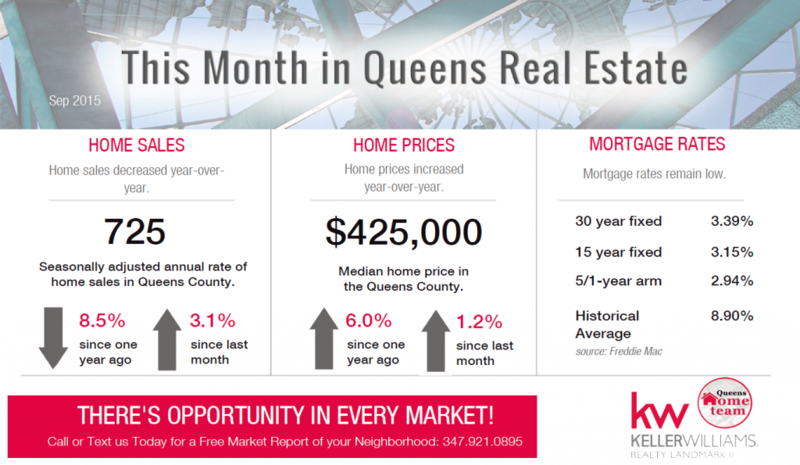 The actual number of homes for sale in Queens is down 18% compared to the same month of the previous year. This led to the months of supply inventory, which measures the relationship between supply and demand, to drop to 6.75 months. This number remains tight as low interest rates spur more buyers to enter the market. New home construction has recently shown signs of increasing; however, this recent uptick has not yet been enough to alleviate pressure on existing homes. Specifically, there are currently 2,796 homes for sale in Queens; 512 Condos for sale; And 1,293 Coops for Sale, equaling a total of 4,601 homes for sale in Queens.